With Sr. Cletty and three of my four children, 2005. Hope swelled with the first rays of dawn and the chirping of various exotic birds, and just as quickly receded as minutes crept by without any sign of an approaching car. When at last the vehicle pulled up, half an hour late, I joined Sr. Cletty in the back seat, charged with anxiety. Long lines of cars snaking through traffic jams further weighted a tense silence. We crawled along at the speed of a car in a parking lot. The driver sighed every now and then, and Sr. Cletty and I tried not to look at the clock on the dashboard. At last pulling up curbside at the airport, a plane roared overhead. Sr. Cletty laughed nervously and said she hoped it wasn’t ours. After cruising through security and running to the counter with racing hearts, the agent confirmed that, yes, indeed, it was. Somberly we joined a line at the ticket counter and booked the next available flight, to depart several hours later. We phoned our connection in Western Kenya and reported our predicament. And that’s when the day turned upside down – both what actually happened, and my expectations of it. Sr. Cletty and I retreated outside and settled on a curb in the parking lot to wait. In this drab, mundane setting, I began to ask about her life. The tiny, unassuming woman shared with me a radical story of how she saved an entire orphanage at gunpoint in Burundi. She described interfacing with the invaders, praying constantly, then fleeing across the compound to warn the other sisters and children. They shot her and she fell. They ushered her back to the sisters’ area, wounded, and threatened her at gunpoint, demanding any funds on sight. She refused, and a man fired the gun. The bullet somehow ended up in his wrist just as the police arrived and rescued her and the compound! Suddenly my original intentions for the day dimmed in comparison to the moment I had suddenly stumbled into, the awe I felt to be spending the day with this hero of the faith, in the presence of the Gospel beating alive and well in flesh-and-blood. By the grace of God, my heart received an invitation into a Great Exchange. I set aside my own expectations like a bag of bones in order to receive something far grander, something that would change my life. We caught our new flight and arrived in Kakamega. Our contact greeted us warmly, but the car that picked us up sputtered and died on the side of the road. The fuel gauge showed the tank to be empty, so the driver hopped on a matatu (public transport) and took off. Our contact apologized and explained that the car was a taxi he hired, and perhaps the driver forgot to check the gauge. Sr. Cletty and I caught each other’s eye in the back seat and started laughing. Sr. Cletty napped while I tried to ignore all the people passing by, staring curiously at a Kenyan, a White woman, and a nun sitting in a stalled car. I was acutely aware of the bulging packet of funds I carried to pay the lawyer. The driver returned and added fuel, but the car stubbornly refused to start. A mental image intruded into my mind of a gnarly hand holding the car engine, and another hand slapping the knuckles with a rod, causing them to release their grasp. I don’t usually see visions, but then I don’t usually hang out on the sides of roads in foreign places with Mother Teresa sisters and people who look nothing like me, loaded with a bunch of cash. So, I prayed according to the image. The driver attempted another start, and this time the engine engaged. We continued rolling over hills of lush greenery and by fields of sugarcane, having missed our second appointment with the lawyer. He texted that he would no longer be able to meet us because he was due in court, but arranged for his assistant to receive us. Sr. Cletty and I laughed again. Actually, we never stopped for the rest of the day as one ludicrous event after another unfolded. I would say we were rather giddy. Arriving at long last in the lawyer’s office, the assistant asked some questions, but did not seem to know much about our paperwork or process. We expected to sign an affidavit to commence the process, but the assistant informed us that the office printer was broken so we could return the next morning. After explaining that our return flight was scheduled to leave later that day, we agreed that the document could be overnighted to Nairobi. Sr. Cletty and I returned to the airport with time to spare and enjoyed coffee in an outdoor café like old friends, still chuckling. We crossed the tarmac to the airplane in a glorious, hazy, golden African sunset. I left Kakamega, seemingly much poorer after purchasing two round trip airfares for two people, never once meeting the lawyer, and unable to initiate the legal case that held the promise of being my ticket home with our daughter. 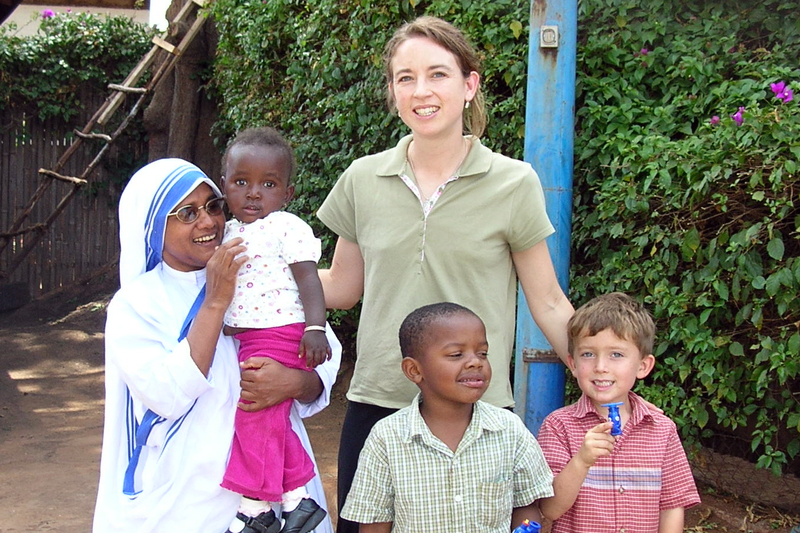 But I flew back to Nairobi with treasure that shapes my life to this day – the incredible privilege of sitting at the feet of a Mother Teresa sister, of laughing at all that tried to push us down, of pondering the beauty of a life poured out on Jesus’ behalf, a life that makes ordinary expectations seem very dim indeed. I learned on that day to watch eagerly for Great Exchanges. Are there any secret invitations nudging your heart today?